As you well know, the place where we live is not just a house or apartment, it is our home. I love quilts that represent my home and wanted to share a few House/Home Quilts with you today. This first picture is of a Kate Adams print that is framed in black. If you are not familiar with her work in miniatures done in antique fabric you should Google her. It is incredible. I love this little set of nine red houses. They look so quaint sashed with a white stripe and little red cornerstones. The next quilt (11.5” x 11.5”) was made by my friend Doris DeGenova and I was lucky enough to win it at a RMQM Volunteer Christmas party. Her color choices are great and I especially love that she hand quilted it. At first glance, it looks rather simple because there is only one house but the border surrounding the house is quite a mathematically complex triangle border. It makes a perfect fall quilt. This last one (17” x 13”) came about because of a Homespun fabric – House block exchange. Several of us made and traded homespun houses. As I was debating what to do with my blocks I decided to pair each two blocks into a “Potholder” block and then set them together into a nine-block quilt. 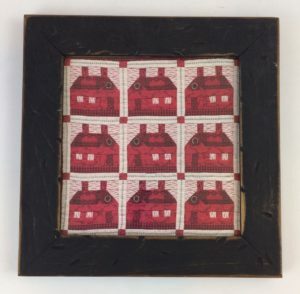 In case you are not familiar with “Potholder” blocks, the phrase was coined by Pam Weeks in her book with Don Beld called Civil War Quilts. 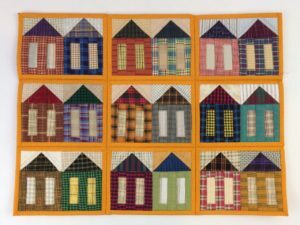 She has done extensive research on these quilts made with blocks which were Quilt as you Go, individually bound and then whip stitched together to make quilts. It is interesting reading if you can find the book at the library or on Amazon. 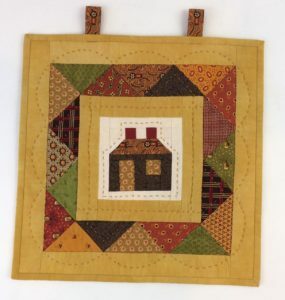 I am quite excited because in less than two weeks I will be attending the AQSG – American Quilt Study Group annual seminar in New Hampshire and Pam Weeks will be giving a lecture on “Potholder” quilts! No matter what method, I hope I have inspired you to try your own little “House Quilt”.